Added: displaying of the average lap speed is now more configurable. Added: switch between list style and a nice grid style view in overviews for cars, drivers, tracks, teams and championships. Added: weather probability is now also being remembered. Fixed: the average lap speed would sometimes jump from one row to another. Fixed: black and white backgrounds didn't work properly. Fixed: sometimes a wrong maintenance warning was shown. Fixed: an issue where the lap counting would no longer work after a weather change (issue#00656). Updated translations, thanks to all translators! Improved the handling and layout of all forms and dialogs. I'm having some issues with the race randomly stopping as if the start button has been pushed. I'm not sure if it's the Bluetooth dongle or Smartrace having issues, I haven't checked with the official Carreras app yet. Is it happening immediately after starting/restarting the race? I found when I allowed SmartRace to do a track call or restart the race, it would make a track call on its own a second or so after restarting. I related the issue to my device essentially reading a "double tap" when I touched the screen to resume the race, thus making SmartRace think I restarted and then immediately initiated a track call. I have since disabled allowing my device to initiate the track call/resume feature, and use just the "START" button on the Control Unit itself. I didn’t know you could do that, is it a setting in SmartRace? I’ll have a look, maybe this will be a fix. My guess is that the issue is the firmware in your App Connect. I have been stymied but this issue as well. There is a good thread about the issue. I sent mine back to Carrera to (hopefully) fix! *** I received a replacement/new appconnect and it seems to have solved the disconnection issue. See my post on the main thread on this issue. Cheers. Last edited by Spokanesteve; 05-15-2018, 08:40 AM. If you have any issues using SmartRace or if you have useful ideas, please head over to https://support.smartrace.de and let me know (or just post them here :-)). BIG NEWS! SmartRace Connect is now available as an extension for SmartRace. 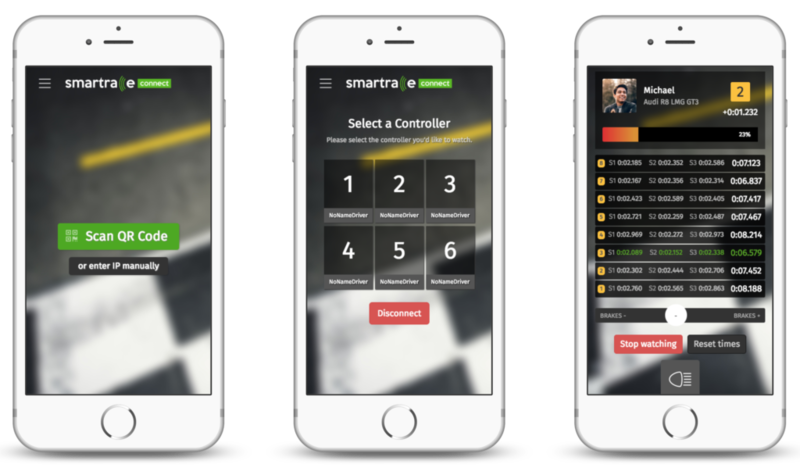 Every driver may use their mobile device as a personal driver display and connect wirelessly to SmartRace. That is awesome news. SmartRace is the best! Thanks! I have been waiting for this one. Looking forward to playing with it but sadly, track is in rebuild for a bit. I’m assuming the driver displays are just that, displays, without two way functionality. A great future add would be to incorporate a track call button on the display if possible. Just a thought as I’m headed toward manually wiring them in around the track. Thanks for the continued development. I really like to support all the after-market racing software developers. It's a lot of work and I HOPE it's financially worth it but I doubt it. Each of them adds a lot to the hobby we love and supporting them is pennies on the dollar compared to some of the costs of this hobby! Marc - If my friends come over do they all need Smartrace to use the new linkup feature? They only need to download SmartRace Connect (which is free). You only have to make sure all devices are on the same WIFI (which could even be a hotspot or guest WIFI). Your friends may than just scan the QR code which is generated by the SmartRace Connect add-on from your device which runs SmartRace (you need to buy the SmartRace Connect add-on on this device). Thats it! Please let me know if you need any more support with this.